A 26-year-old man was killed in a crash in the Highlands yesterday while heading to work with a colleague. 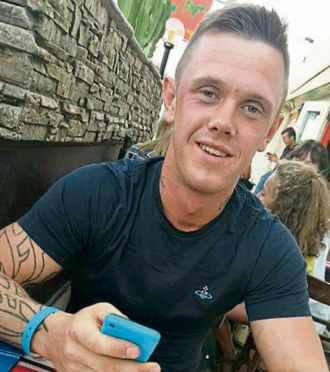 Shaun Allan, who lived in Westhill, Inverness, was a passenger in a Ford Focus RS which smashed through a garden fence and into pine trees after leaving the B851 road at Farr, 10 miles south of Inverness. The emergency services rushed to the scene just before 7am and fire crews used cutting gear to free the car’s occupants. Mr Allan died of his injuries. The male driver of the car suffered serious injuries and was taken to Raigmore Hospital by ambulance. His condition was not known last night. Road policing Sergeant Donnie Mackinnon said: “Our thoughts are with Mr Allan’s family and friends at this time. A collision investigation was carried out at the scene and the road reopened shortly after 2pm. A Scottish Ambulance Service spokesman added: “We received a call at 6.57am to attend a road traffic collision on the B851 at Farr, south of Inverness. Pauline Joyce, 88, spoke last night of the shock of finding dozens of emergency personnel in her garden dealing with the tragedy. The pensioner said she is partially deaf, adding: “I didn’t hear anything, not even the car crashing into the trees. “That was about when I just got up, 7.20am or 7.30am. As well as a damaged fence and trees, debris from the crash also broke a window. Both Mr Allan and the driver were employed on a massive powerline development and were travelling to work on energy giant SSE’s Knocknagael-Tomatin project when the tragedy happened. Scottish and Southern Electricity (SSE) is currently constructing a new substation and overhead line as part of the Knocknagael-Tomatin reinforcement project. The project will see the construction of a new 275kV overhead line between an existing substation at Knocknagael to a new substation in Glen Kyllachy, five kiliometres from the village of Tomatin.